Testing an eye makeup remover is pretty basic. It'll either take off all your makeup or leave you with panda eyes . Seeing as I have eye makeup removers from two reputable brands in my little sample box, both which I'm sure will work superbly, the only way to really review them is to pit them against each other. The Clinique take the day off makeup remover is extraordinary and a favourite of mine. I own the larger size of this and it tackles even the toughest of eye makeup with ease. I also love how it is unscented! As this is a dual phase remover, you'll need to give it a rigorous shake before use (one of my daughter's favourite pastimes!). Being an oil based remover, there's a nice slip to it as you swipe across your eye, absolutely no tugging involved with this one! I do however need to take a few passes to remove every last scrap of makeup and the oil leaves behind a slight film so I like to follow up with a cleanser. Packaging wise, it comes with a no spill lid with a child lock which will ensure that the lid won't accidentally pop off. I hate the wide necked bottle though and if you're not careful, you can easily tip out too much. 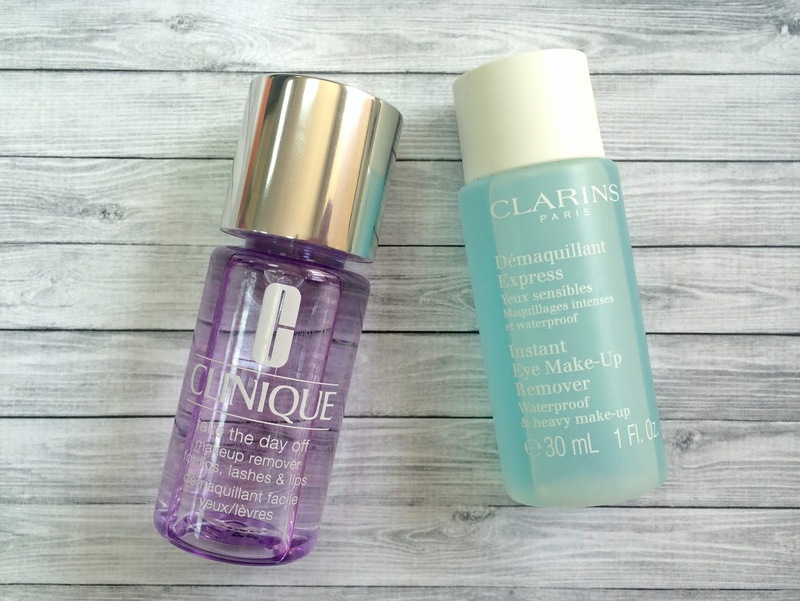 The Clarins Instant Eye Make-Up Remover is new to me and I was eager to see it against my trusty Clinique. It's also a bi-phase remover, however unlike the Clinique one, I find that it doesn't leave behind any greasy residue. The cap is just a simple twist off one, though once removed, you're left with just a small nozzle so there's no product wastage at all. This is slightly scented, but to be honest this really doesn't bother me. 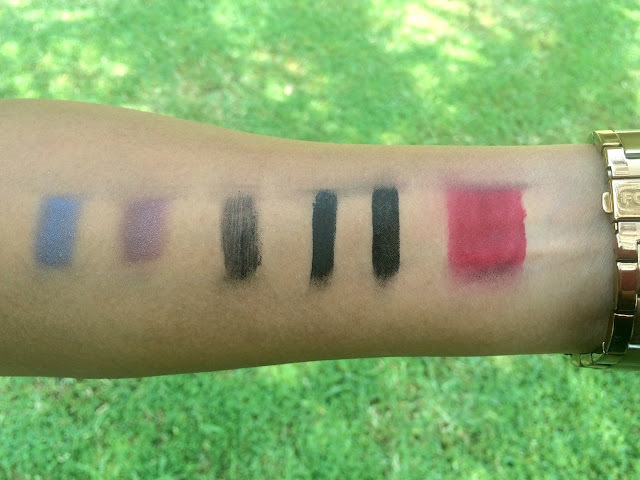 I took the liberty of swatching a few different makeup products on my arm. The 1st and 2nd swatches eye shadows. The 3rd swatch is my current daily Estee Lauder mascara (review here). Unfortunately I don't wear waterproof mascara, a habit instilled in me by my optometrist. 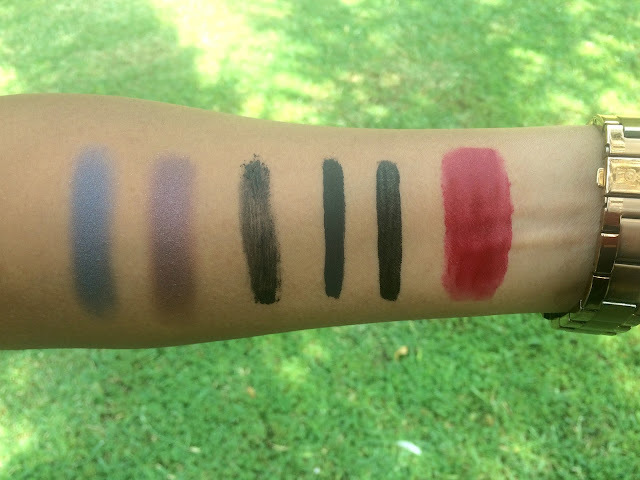 The 4th and 5th swatches are my liquid eyeliners, one of which has been reviewed here and finally I have a Bourjois liquid lipstick (post here). I wanted to throw a lip colour in the mix as the Clinique makeup remover explicitly states that it can be used on the lips. This is one of my longest wearing lip colours and surprisingly stays put for the most part while swimming! So how did the two removers perform? I swiped along the top portion of the swatches thrice with the Clarins Instant Eye Make-Up Remover and I initially thought it performed rather well until I tried the Clinique Take the Day Off remover along the bottom. Comparing the two, I feel the Clinique remover did a better job of removing the makeup without smudging it across. Of course, both removers delivered and with further swipes, I was able to fully clean up my arm, but the Clinique outperformed ever so slightly. So in the battle between Clarins and Clinique? Clinique by a small margin! What are your staple eye makeup removers? Do you have a drugstore equivalent that works just as well, if not better? I love micellar waters to remove my eye makeup, I find them so much more gentle than other products :-) My go to's are My Little Beauty and Garnier! Oh, I forgot about micellar water and have Bioderma's version in my bathroom. Should whip that out and compare. I haven't tried the Garnier one though, nor My Little Beauty. Thank you for the suggestions. I have those products and I love it!